The Kenyan government is struggling to respond to revelations that a multi-billion dollar contract with China may imperil its sovereignty, according to The Daily Nation newspaper. Details of the loan for the Standard Gauge Railway, Kenya’s largest infrastructure project since independence, emerged Sunday when The Nation published excerpts from a 2014 contract between the Export-Import Bank of China and the Republic of Kenya. Beijing’s infrastructure deals typically unfold in secret, and The Nation’s reporting provides a rare glimpse into how China structures the terms of its loans. Now, according to the paper, the government has canceled planned appearances and scheduled emergency meetings to determine how best to navigate the latest in a series of damaging reports about the SGR’s funding, construction and operation. The contract also stipulates that Kenya must use Chinese “goods, technology and services” in the railway’s construction and operation, and a confidentiality clause prohibits the Kenyan government from disclosing the terms of the contract without Beijing’s expressed written consent. The excerpts provide some of the most tangible evidence to date that Beijing may engage in what critics, including the United States, characterize as debt-trap diplomacy — lending designed to force countries into handing over land, minerals or strategic assets when they default. The Nation didn’t reveal how it acquired the contract, nor how it determined its authenticity. But language in the document closely matches contracts VOA uncovered for projects tied to the Belt and Road Initiative, China’s trillion-dollar global infrastructure plan, in Serbia, Kyrgyzstan and Guyana, suggesting the terms of the Kenya loan, from asset seizure and confidentiality clauses to stipulations about using Chinese vendors, may reflect Bejing’s lending practices across Africa, and beyond. 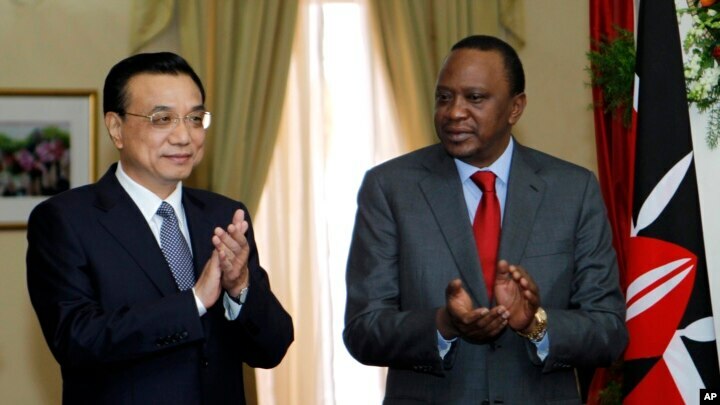 Chinese Premier Li Keqiang, left, and Kenya’s President Uhuru Kenyatta applaud after the signing of the Standard Gauge Railway agreement with China at the State House in Nairobi, May 11, 2014. Charles Kanjama, the Nairobi Branch Chairman of the Law Society of Kenya, told The Nation that some features of the contract, such as the confidentiality clause, are typical. He raised concerns, however, with other language specifying that all disputes around the contract must be arbitrated in China. Since launching in 2017, the SGR has been marred by allegations of corruption, racism and poor management. Both Kenyan and Chinese officials have faced criminal charges. Even before ground broke on the project, analysts raised concerns about the cost of the project and design decisions that brought the track through the middle of one of the country’s largest national parks. Late last month, President Uhuru Kenyatta pushed back against claims that Chinese lending has hurt the country. “China is not seeking to colonize us, but they understand us to our point of need,” Kenyatta told a roundtable of journalists, The Star, another Kenyan newspaper, reported. “We are ahead of the payment schedule, and so Kenyans must ignore any propaganda being peddled. I will continue to borrow, but develop,” Kenyatta added. Despite ongoing controversies, some experts say the railway could still be a net-positive for a country in need of infrastructure to support its long-term development. 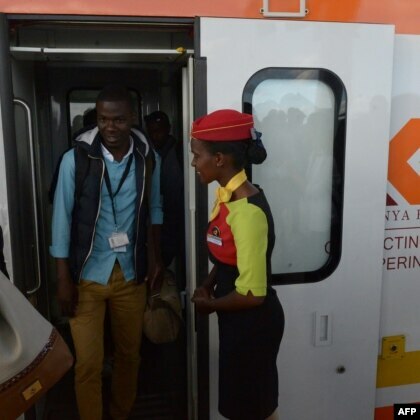 “The standard gauge railway is a real game changer,” Irene Sun, the author of “The Next Factory of the World,” a book about Chinese manufacturing in Africa, told VOA. Before the SGR, Sun added, Kenya’s two largest cities, Nairobi and Mombasa, were connected by poor roads and an unpredictable 10–15 hour drive. “Now you have a railway where you can get on a train and you can arrive at the other end in five hours,” Sun, an associate partner at the consulting group McKinsey & Company, said. Voice of America provides trusted and objective news and information in 45 languages to a measured weekly audience of more than 236.8 million people around the world. For over 75 years, VOA journalists have told American stories and supplied content that many people cannot get locally: objective news and information about the US, their specific region and the world. “The Dragon’s Reach” aggregates reporting on China’s ‘Belt and Road Initiative’ from the USAGM’s five independent news agencies: Voice of America, Middle East Broadcast Networks, Radio Free Europe/Radio Liberty, Radio Free Asia and The Office of Cuba Broadcasting.